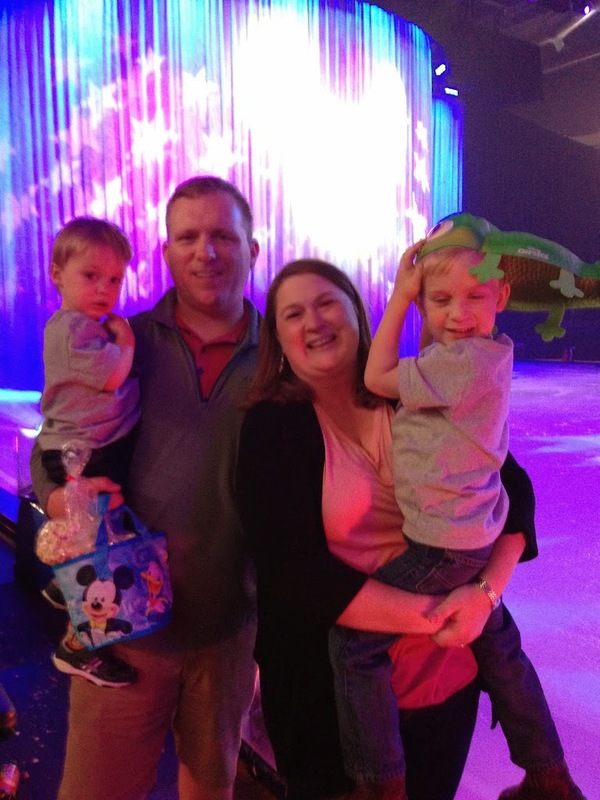 Have you taken your kids to a Disney on Ice performance? We went for the first time to one last night and it exceeded every expectation I had! 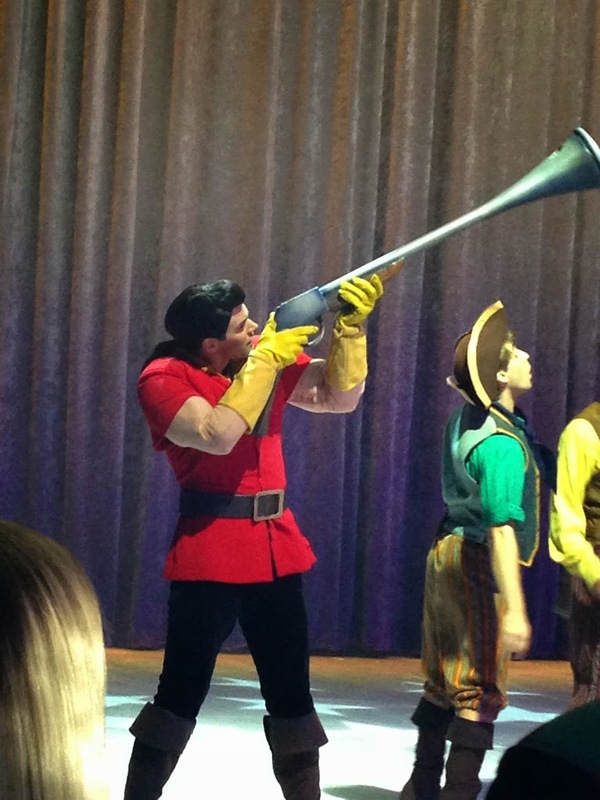 We’ve seen Disney Live performances and obviously have been to many shows in the Disney Parks. I definitely expected a certain level of Disney excellence, but this show really went above and beyond! Feld Entertainment did an outstanding job! we were doing after dinner so the anticipation was building. 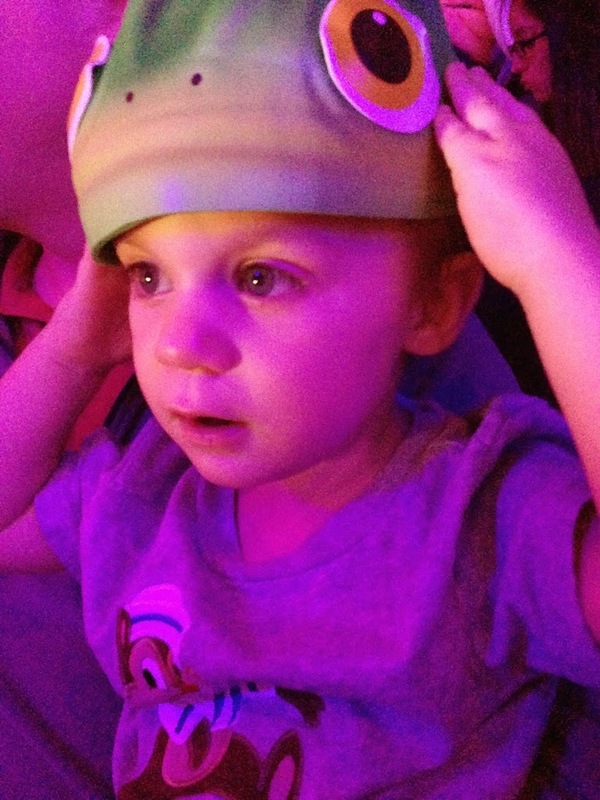 After ruling out that we weren’t going on a Disney Cruise (that was their last #DisneySurprise), they had no idea what they were going to see. We waited to tell them once we were inside the arena and they were so happy! 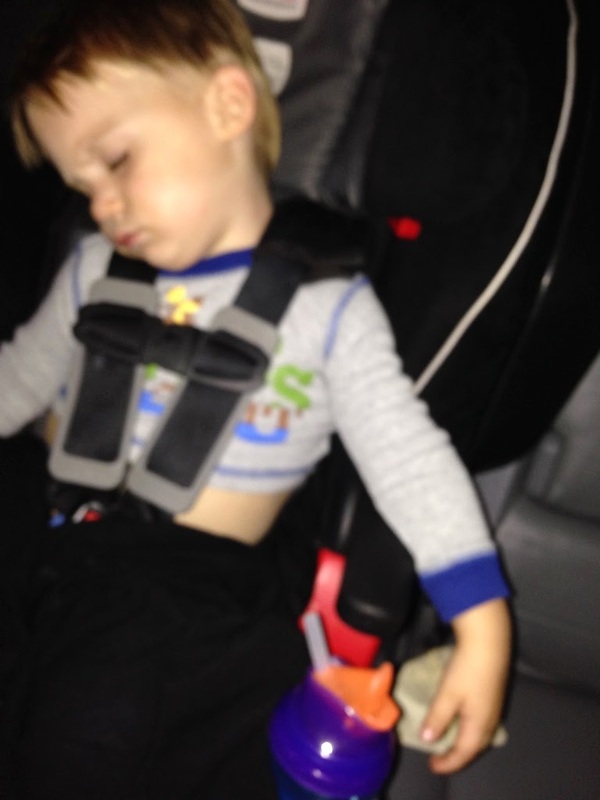 I wish I would have had the camera ready for our two year old’s response. He covered his mouth in surprise! Getting in and out of the parking area is really a breeze. The parking attendants are organized and the price was really reasonable, $10 for self parking and $15 for valet. We self parked. Gathered up our belongings and headed inside to the security line. It moved very quickly, but uh-oh, we got sent back because we had our camera that had a detachable lens and surprisingly we didn’t have our point and shoot in the camera bag as a back up. Read that again so you don’t make our mistake-NO REMOVABLE LENS CAMERAS ALLOWED. That being said, I apologize now for my quality of photos. I am not as skilled with the iPhone camera. Once inside we checked out the snack offerings and merchandise tables along with the photo opportunities. The photo opportunities were disappointing. They don’t compare to the Disney Live photos and for anyone who has spent time in the parks, they really were a bit of a let down. 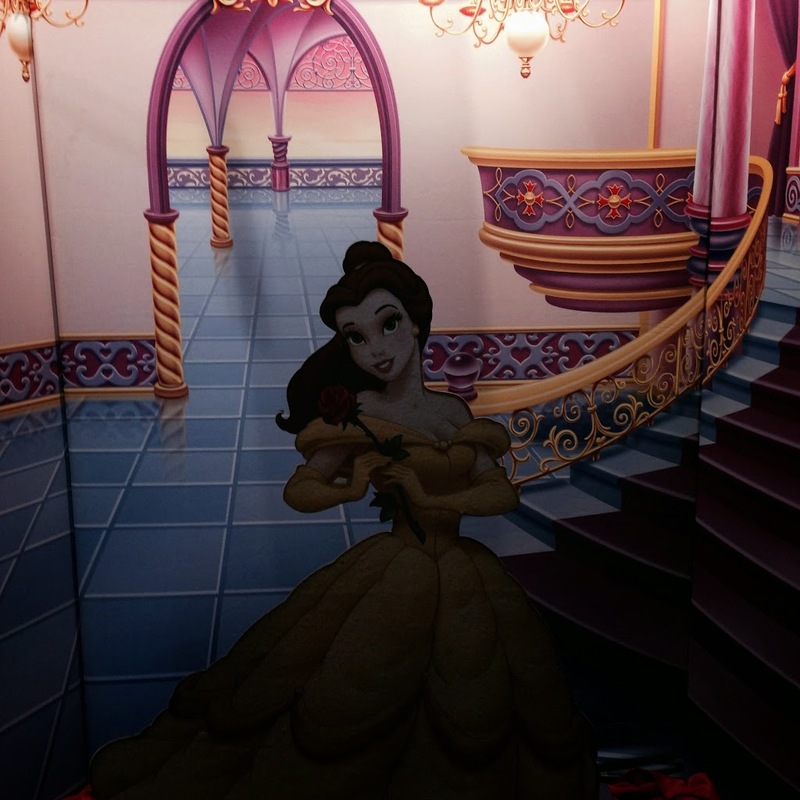 You can take your picture with a cardboard cut out of Belle for $15. Or you can spend $20-$24 for a green screen option that shows you standing in front of a variety of backgrounds like a castle, etc. We skipped all of the above. I did get to snap a picture of the backdrop but you are not allowed to take a picture of your own with the kids in it without paying the fee. The merchandise tables were focused mainly on “girl” toys as my boys would say. A ton of princess options but they did have a couple of swords here and there. Overall, if I were you, I would save my money and buy something from The Disney Store. They did have cute coloring books for only $5 if your child is one that must have a souvenir. The regular concession lines are open and plenty of people were having dinner there. Then there were the DISNEY concession lines. Of course that is where our family ended up. I had unknowingly promised them the most expensive cotton candy and popcorn in the world before we had entered the arena. $12 for each in the picture. The smile was worth the $12! They were very fresh though so it was all good. The hat comes with the cotton candy. 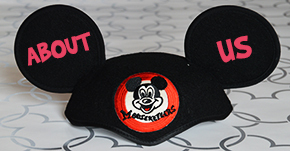 You can also get a crown with Mickey Ears on it too. One quick aside about the prices of the merch and snacks-I heard more than one person in line say this must be what it is like at the parks. It absolutely is not like that at the Disney Parks. 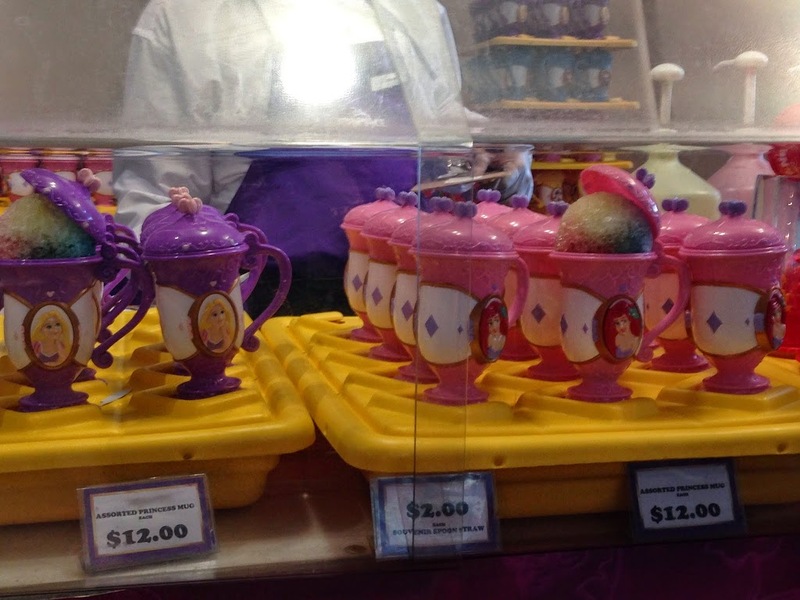 Yes things are a little more there, but overall the merch prices were 30-50% more for similar park items. 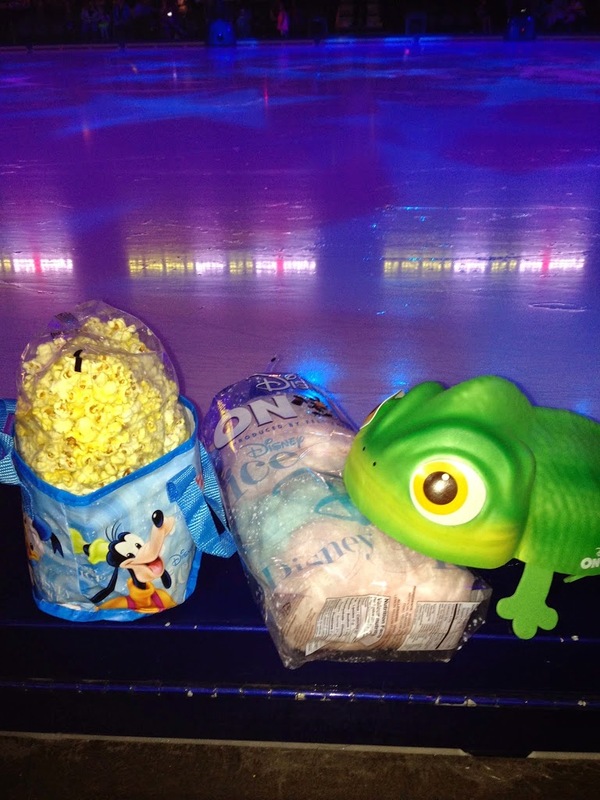 The snacks were double the price as the parks even when factoring in the cute presentation. So if you have not been to the Disney Parks, please don’t be discouraged by these price points. Now, on to the show! 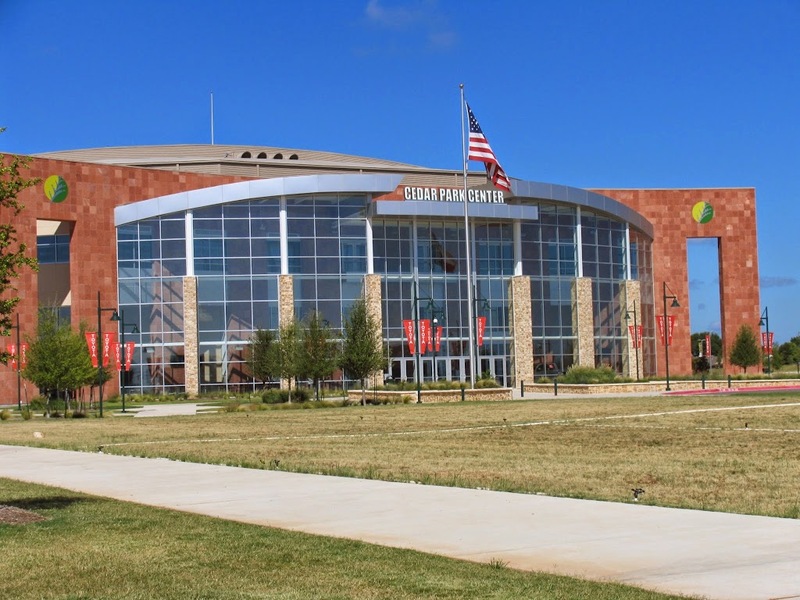 The Cedar Park Center is a perfect set up. 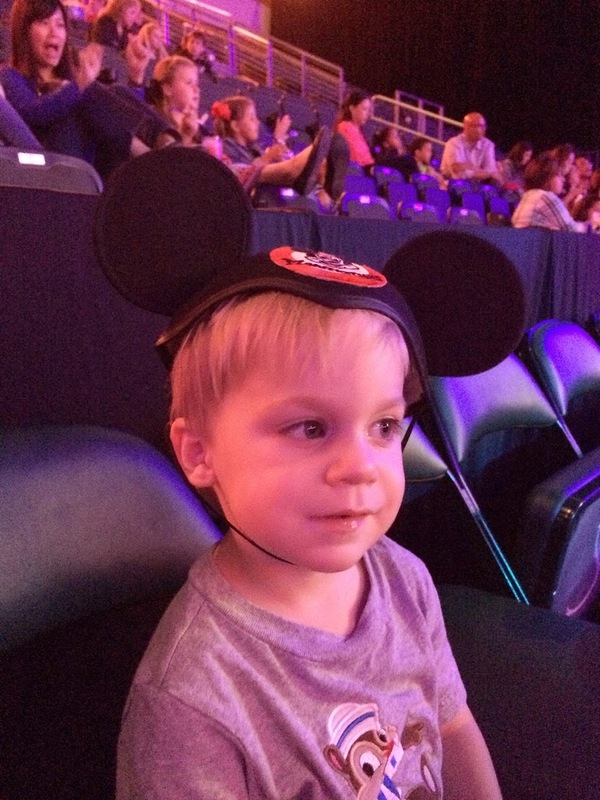 There isn’t a bad seat in the arena so no matter where you purchase tickets, your little ones will enjoy the show. The event staff seemed to have been trained by Disney themselves. Feld Entertainment did an incredible job with the staff. 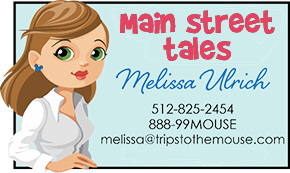 They were helpful, courteous, and had the Disney magic all about them! 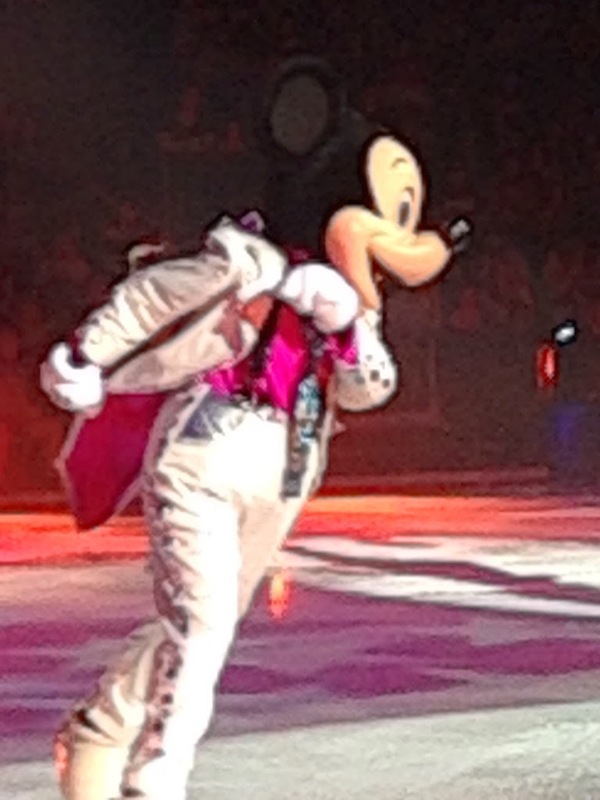 A group of Rockin Ice Dancers starts the show off and then Mickey and Minnie Mouse are introduced! Donald and Goofy join them but no Daisy for some reason. 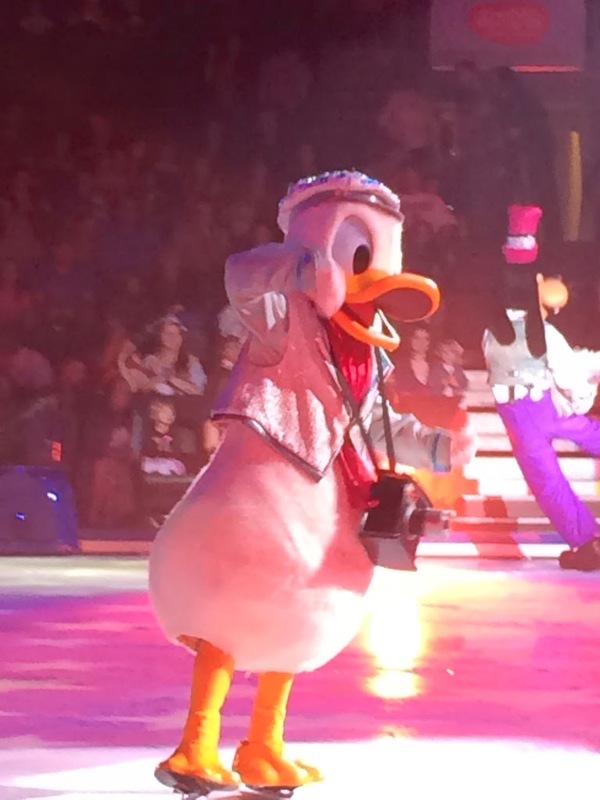 Mickey and Goofy were really impressive skaters. Our kids were in awe of them of course. There was a lot of 80s music represented to get the parents moving and alive. The show had different fairy tales represented and you got a taste of the overall story but not the complete story line. Anastasia and Drizzella were first and they were hysterical. My youngest was a bit concerned for their safety but I told them they were just being silly. Then Pinocchio made an appearance. given she is a huge sea witch. 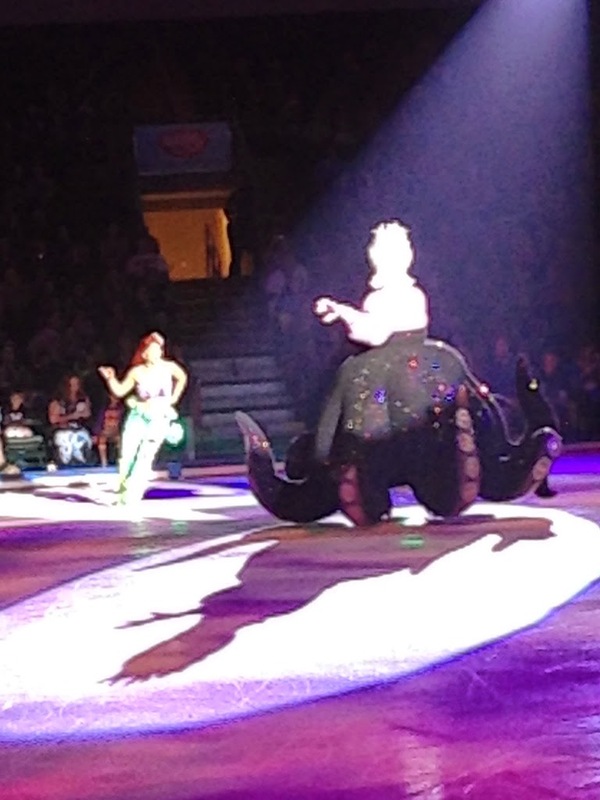 Ariel did more acrobatic moves than I expected at this show. Here’s a short clip where you can see Ariel, Prince Eric, and Sebastian. I was not trying to capture every movement just a little peak for you. After The Little Mermaid, Rapunzel came out. 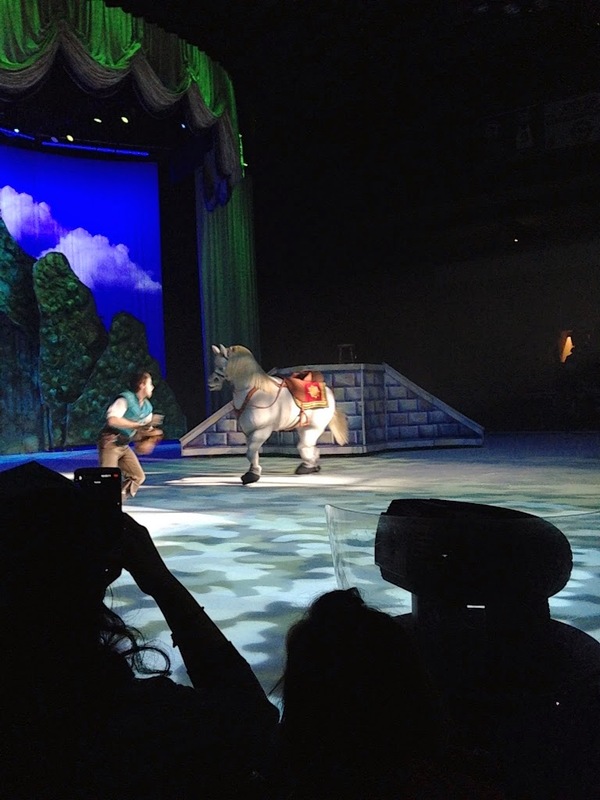 I don’t want to give it all away but you will see a lot of frying pans in this segment but most impressive of this act was Maximus the horse skating on all four legs! 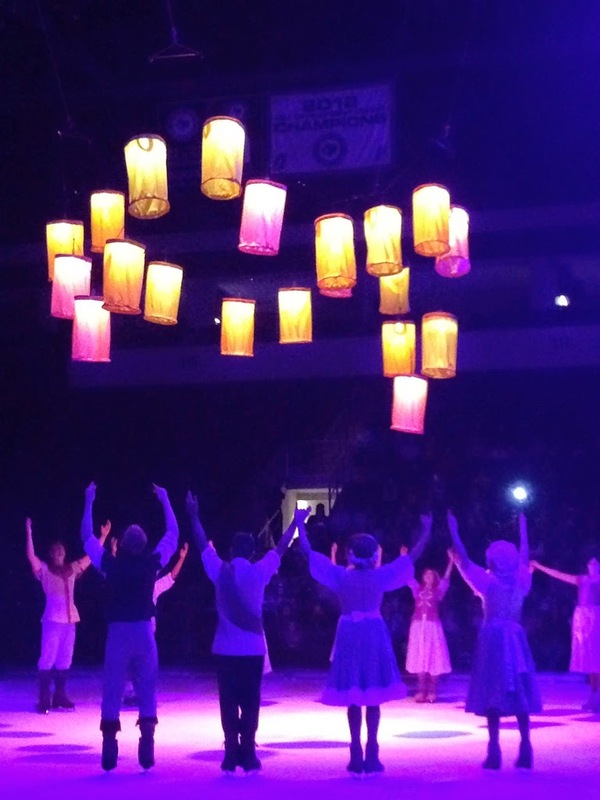 The Lanterns were especially beautiful. At about 55 minutes from the start, it was then intermission time. Important to note for potty breaks. The bathroom lines were quick moving. We still had plenty of snacks left so we didn’t even take a look at the snack lines or merchandise lines. The intermission was about 15 minutes long. Mickey and Minnie came back to introduce the next act. 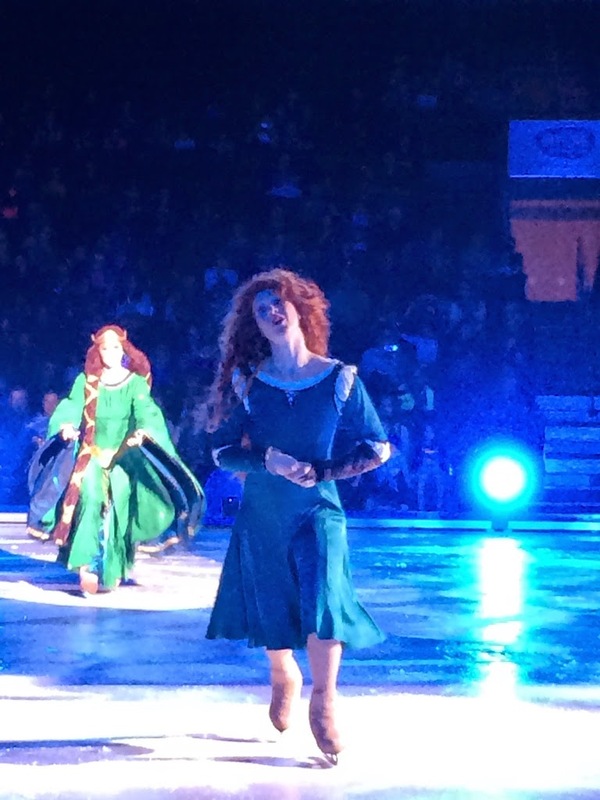 Merida and the cast from Brave were there! Our kids have not seen this movie yet but both were mesmerized. I thought the little brothers were a little creepy but my four year old adored them and waved every time they came skating by. This segment demonstrated a few theatrical “tricks” that left our boys in awe. You will have to see for yourself! Now, the show stopper-Beauty and the Beast. This was our entire family’s favorite part. I am biased but the rest of them aren’t. This is my favorite Disney movie and fairy tale. The French village was exquisitely recreated. Belle was by far the most talented ice skater of them all. 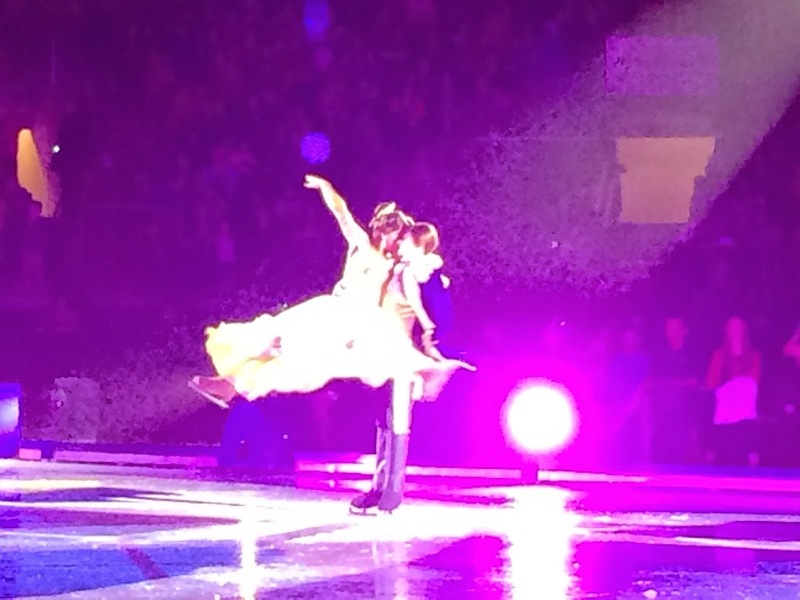 She was elegant and graceful and did more moves than any of the others. Gaston had a few of his own to show off too. The costumes in this segment were incredible, especially the knives and forks. I was worried about our kids lasting the entire show since it was way past their bedtime but both were not going to move until Belle was finished. There was a finale by the all of the skaters and that is where you realized just how many performers were actually there. The entire cast deserved a standing ovation in my opinion. All of the special effects and lighting enhanced their performance. The set designs were more than I would have expected and perfectly done. Overall, our entire family gives the show two thumbs up! We are ready to see Frozen next! 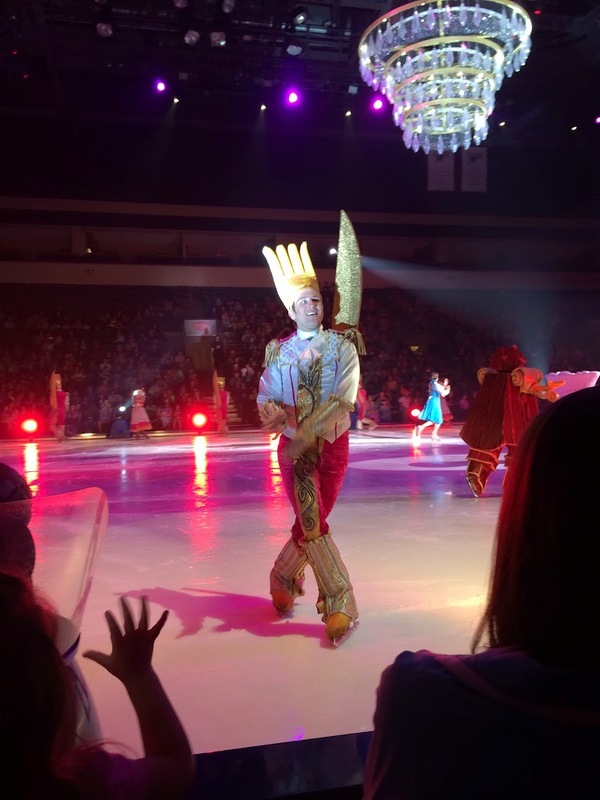 Are you going to see Disney on Ice in your city? Austinites, do you already have your tickets? If not, don’t worry, there are still some seats left but buy them quickly! They are selling fast. It made for a perfect family date. Your little princesses and princes will love it and you will too! Buy tickets here through Ticketmaster or at the Box Office. Please note the Friday evening performance was cancelled due to a hockey playoff game. 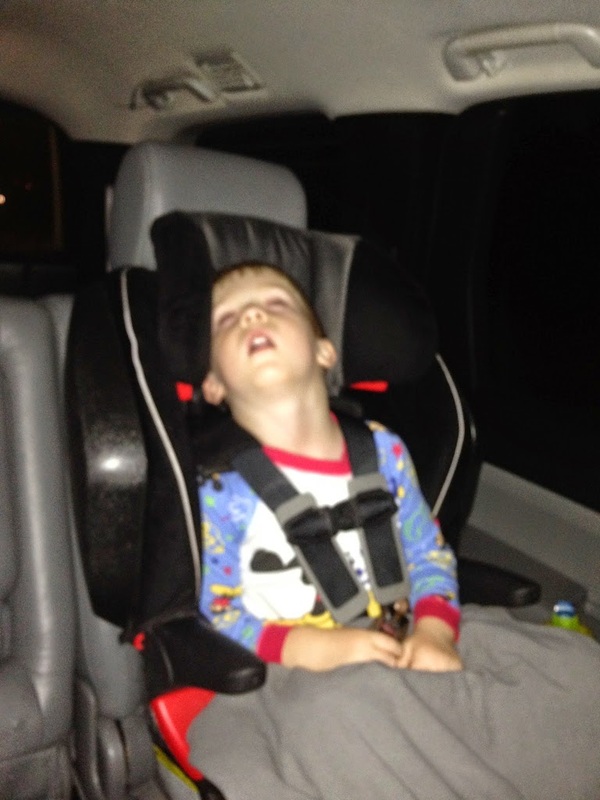 And here on the way home you can see how happy and tired they are! 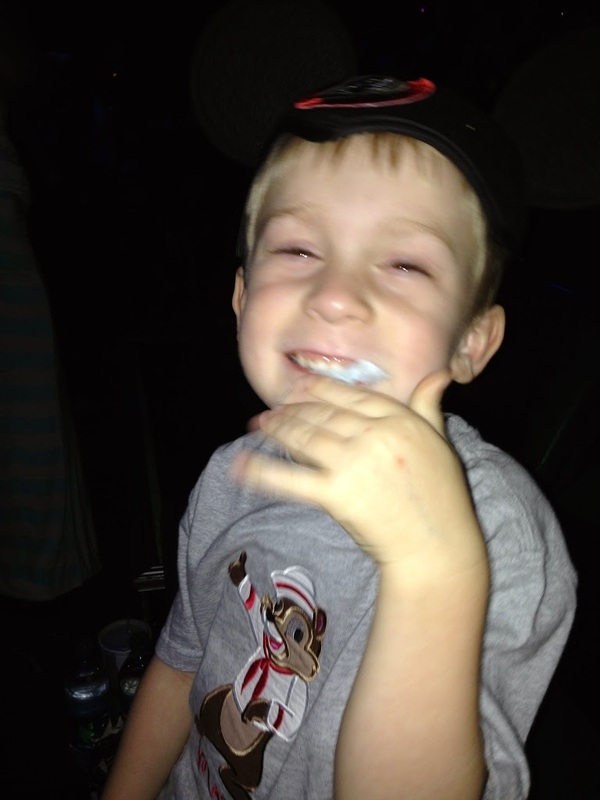 I hope your family has just as much fun as we did making those magical Disney memories!